With the Deferred Action for Childhood Arrivals program renewal deadline looming, immigration rights protesters staged a demonstration outside Sen. Dianne Feinstein's Westwood office Thursday, blocking traffic and drawing officers in riot gear. 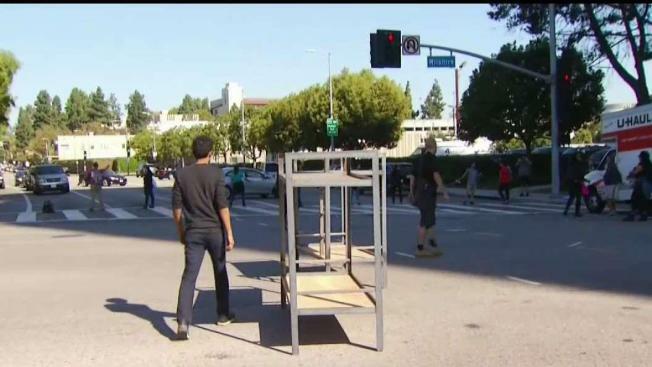 The group began gathering on the corner of Wilshire Boulevard and Veteran Avenue around 9 a.m., and about an hour later, they spilled into the intersection. Nine people were arrested. As traffic began backing up, police declared an unlawful assembly around 10:30 a.m., and officers began making arrests a short time later as demonstrators refused to leave the intersection. Some drivers tried to wind their way through the demonstration while police were making arrests. Southern California is the the region of the country that would be most affected by the repeal of DACA. Take a look inside the numbers. Officers had the intersection cleared by about 10:45 a.m., with protesters on the sidewalk chanting, "Let them go," calling on police to release the people who had been arrested. Protesters are calling for an end to deportations and an extension of the DACA program. There are no reports of any injuries, although some motorists have been attempting to drive through the intersection around the protesters. As of Thursday morning, about a quarter of DACA renewal-eligible people — that's a little more than 118,000 — have not submitted requests to renew, according to the Department of Homeland Security. Thursday is the deadline for work-permit renewals under the DACA program, which has protected an estimated 800,000 people who were brought to the country as children from deportation. DACA, instituted in 2012 by President Barack Obama, DACA allows people who were brought into the United States illegally as children to work and study in the country without fear of being deported. DACA has been available to immigrants without criminal records who were brought to the country when they were younger than 16 years old. Work permits issued under DACA must be renewed every two years. 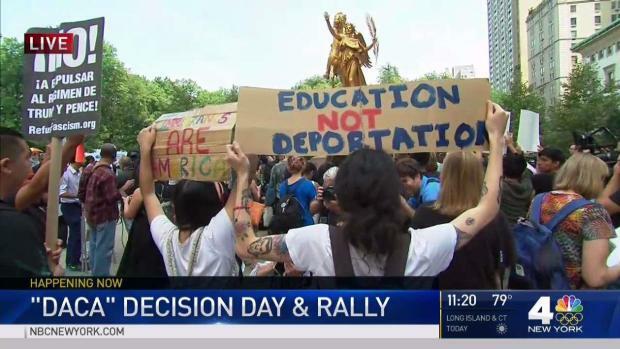 Hundreds of immigrants and advocates in New York and New Jersey are demonstrating at Trump Tower and in Washington, D.C., after Attorney General Jeff Sessions announced Tuesday morning that the Trump administration is ending the DACA program. Erica Byfield reports. In September, President Donald Trump and Attorney General Jeff Sessions announced that the program would be effectively phased out, unless Congress can agree on immigration legislation addressing the issue of childhood arrivals in the next six months. The government stopped accepting new DACA applications, but existing recipients were given until Thursday to renew their permits. "In June of 2012, President Obama bypassed Congress to give work permits, Social Security numbers and federal benefits to approximately 800,000 illegal immigrants currently between the ages of 15 and 36," Trump said last month. "The typical recipients of this executive amnesty, known as DACA, are in their 20s. Legislation offering these same benefits had been introduced in Congress on numerous occasions and rejected each time. Immigration activists planned a series of demonstrations Thursday to protest the renewal deadline, and to call for continuation of the DACA program. Angelica Salas, executive director of the Coalition for Humane Immigrant Rights, said rescinding DACA amounts to a bait-and-switch by the government, which first urged illegal immigrants to come forward and register, and now threatens to deport those people for obeying the law and coming out of the shadows. "DACA has shown us we cannot get comfortable with temporary solutions," Salas said. "For too long the Congress has defied the American people and offered patched-up responses to what is clearly becoming a humanitarian crisis."